Hi Gents, the days passing by and a lot of things happen in the world of collecting. Surfing through the different areas of WAF, GCA and MFF I found very interesting items. Some are so interesting that I asked the collectors if I can use the material for the BLOG…..Sometimes I get an answer and sometimes not. Well that’s the way it is. 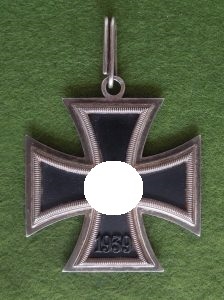 Interesting thing for me as, somebody who is actually not that deep in the field of Knight`s Crosses involved, are the pictures the user Ludwig posted on WAF showing his outstanding Otto Schickle Knight’s Cross of the Iron Cross in a really rare LDO case. I asked him to bring it on “Bacuffz.com” and he gave me a thumbs up. Looking at this nice set you will see that there is no marker on the cross but you have the LDO sign on the case. 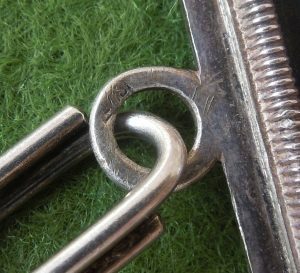 Ludwig made clear that an LDO cased has to have a marked Knight`s Cross inside to follow the regulations. Whatever brought the set together is a secret of the veteran who had this cross during the time of the war. While researching a little bit I found the interesting story that Otto Schickle from Pforzheim in Germany has indeed manufactured Knight`s Crosses but only a short time from May 1940 until July 1941. The first 5 month they produced without L/15 marker, after that they put the marker on the loop. Something happened but nobody knows what it was, but Schickle lost his rights to produce Knight`s Crosses anymore. So that way there are only few Knight`s Crosses made by Schickle on the market. After more and more hours on that topic I learned that there are two different Schickle Knight`s Crosses around the collector`s world. Let´s call them Type 1 and Type 2 for better understanding. First we have to get into the history of the Knight`s Cross before we get into details of Schickle Crosses…. 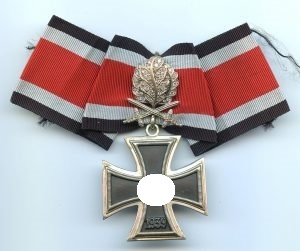 On March 10th, 1813, Prussian King Friedrich Wilhelm III established the Iron Cross as a temporary gallantry award for bestowal during times of war. 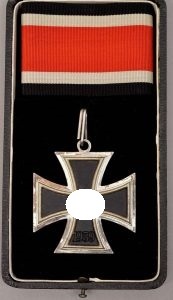 Originally the Iron Cross was introduced in three grades with a Grand Cross intended for award to Senior Commanders for successfully leading troops in combat and the First and Second classes for award to all ranks for bravery or merit in action. The Iron Cross were reinstituted by King Wilhelm I on July 19TH 1870 for award during the Franco-Prussian War and again on August 5th, 1914, by King Wilhelm II for award during WWI. On September 1st, 1939 Hitler once more reinstituted the Iron Cross series of awards in the First, Second and Grand Cross Classes and established the new Knight’s Cross of the Iron Cross. Hitler reserved the right to personally authorize bestowal of the Knight’s Cross and all ranks were eligible for the award. Originally the criteria for bestowal of the Knight’s Cross was outstanding personal bravery or decisive leadership in combat but this was later expanded to include personnel who had continually demonstrated exceptional acts of courage or an extremely high success rate on the battlefield. 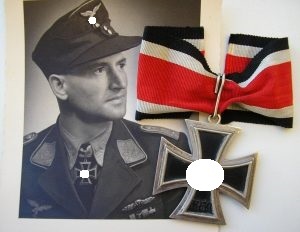 The Knight’s Cross of the Iron Cross was the most coveted award of the Third Reich period and those presented with it were elevated to the status of a national hero. 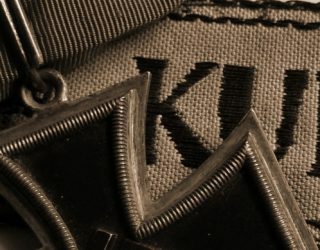 In total it is estimated that roughly 7,360 Knight’s Crosses were awarded during WWII, a relatively small number when one considers the amount of troops fielded and the magnitude of the war. Due to the prestige of the award personnel who could afford it would opt to buy a jeweler’s copy for everyday wear with the actual award being put away for safe keeping. 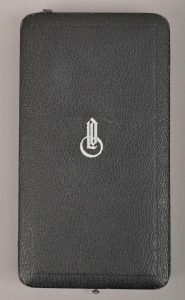 Of Note: The LDO, “Leistungsgemeinschaft der Deutschen Ordenshersteller”, (Administration of German Medal Manufacturers), began regulating the manufacture of German awards in March 1941 as a quality control agent for awards that were intended for retail sale and manufacturers were to use an assigned LDO, „L“, code on their products destined for retail sales. Awards that were to be bestowed by the government were also issued an official numerical government contract code known as a, “Lieferantnummer”, (Contractors Number), that was issued by the “Präsidialkanzlei des Führers”, (Presidential Council of the Führers), for formally approved manufacturers. The manufacturing firms that were licensed by both the “Präsidialkanzlei des Führers” and the LDO and would have used the same dies to stamp both the official issue and retail sales types of awards making them virtually indistinguishable from one another except for the markings. 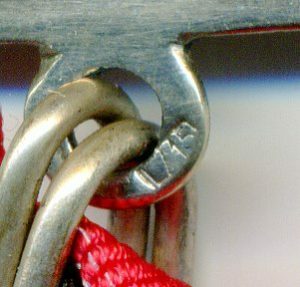 Regulations of November 1st, 1941 prohibited further manufacturing of the Knight’s Cross for retail sale. Of Note: On June 3rd 1940 a higher echelon of the Knight’s Cross was established with the introduction of the Knight’s Cross with Oak-Leaves and on July 15th 1941 an additional two higher grades of the Knight’s Cross with Oak-Leaves were introduced with the establishment of the Knight’s Cross with Oak-Leaves and Swords and the Knight’s Cross with Oak-Leaves, Swords and Diamonds. Finally, on December 29th, 1944 Hitler established the final grade of the Knight’s Cross with the Golden Oak-Leaves, Swords and Diamonds. Also of Note: The Grand Cross of the Knight’s Cross was only awarded once to Reichsmarschall Hermann Göring and the Knight’s Cross with Golden Oak-Leaves, Swords and Diamonds was also only awarded once to Oberstleutnant Hans-Ulrich Rudel. Let us jump in on the different types of Knight`s Crosses from Schickle and what the collector`s scene says about it. I have to make clear that I put only opinions in this Schickle report without stepping on one side. Mostly information`s are from experts which are known as experts on the subject. You might know the name Daniel Grünbaum who is an expert on Otto Schickle badges and also very deep in Knight`s Crosses pre 1945 and post 1945. There are a lot of good information from him we have to think about or put a second thought on it….but finally you have to make up your mind for your final opinion. Also I learned a lot from Mr. Dietrich Maerz who wrote books about that topic which are one of the best on the market. OK let`s put some facts together and see where the road will lead us to. All the Schickle Crosses have the same loop on the Top of the frame, some with the marker L/15 and some without L/15. 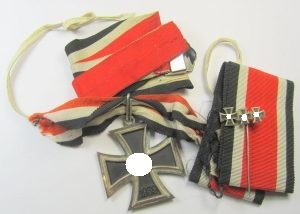 At the collectors market we have seen fake crosses with the marker L/15 on the loop or for example a Juncker Knights Cross with an L/15 marker on it to pimp it……well that did not work. So there might be somebody out there with the right stamping tool L/15 but with not enough knowledge to put that marker on the right cross. So that’s an easy one to spot. Also all the Schickle crosses have a die struck mistake in the frame which can be found on every cross which is offered. In the 9 – 12 area of the front frame there you can find it. Now we move to type one and type two. Look at the pictures from Ludwig`s grouping and on the very clear embossed numbers on the front and the back. 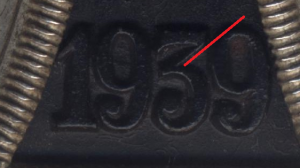 Also on that Cross you can see the angle of the number 3 upper part in 1939 which “hits the head of the 9” if you draw a line in that direction. Better explained with the following picture here. Let`s look at the Type 2 cross. Here we see almost the same indications like on type 2. 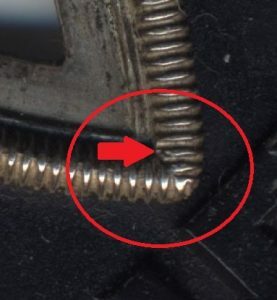 You have the same loop on the top of the frame. You have the die flaw on the 9-12 O´clock area on the front frame. Now let`s check the numbers, not the same clear embossed numbers like type 1…….and if you do the line test from the number 3 to the number 9……it is a different angle. That tells me as a none KC experts that we have two different cores in the same frames! Looking back to the short amount of time Schickle produced their Knight Crosses. Why did they change the design of the core but not the frame? Even if the frame had a “problem” …. If you look closely on the type 2 core you can see a similarity to the post war crosses made by Steinhauer und Lück. How can that be? Thoughts (and only thoughts) bringing me to some “Maybe” points. Maybe it is the truth that Schickle stopped producing type 1 Knight`s Crosses someday and started to produce type 2 until they have to stop it by “whatever” reason. Maybe Schickle stopped the production of Knight´s Crosses 1941 and after the war all the “unused” frames were sold to anybody who put in a post war core and sold them after May 1945 to the veterans who lost their Crosses during the war. Maybe Schickle sold their overproduced Schickle frames in 1941 to somebody who made actually Knight`s Crosses during World War 2. So type 2 is a Schickle Knights Cross but not produced by Schickle. Maybe Schickle`s die tool for manufacturing the cores were getting bad and the numbers weren`t that clear anymore. So there is a possibility that they produced 500 cores with bad number design and put them aside for later. Somebody found them after the war together with other parts from different company’s and started building another version of Schickle crosses. As far as Daniel Grünbaum refers is Steinhauer und Lück the only company where you can find nearly identical cores in post war Crosses like type 2 Schickle cores……that’s also a fact to think about. Theres also a possibility that Sedlatzek, Schiffer or Souval bought all the rest of different manufacturers and started producing after May 1945. A lot of questions and maybe a good start for more research on the topic. I wonder about the price of Schickle Typ 1 Knight`s Crosses. The price for a Schickle Cross is far higher than for other crosses. I can remember that a Schickle Type 1 was sold shortly for 10.500,- Euro without any case, only the cross with ribbon. On the collector’s guild you will find a type 1 for 13925,- US Dollar and on Christian von Eickes Web shop a cross was sold for nearly 13.455,- Euro. Well that’s a lot of money……. Hope some of the KC Collectors out there will come up with more information on the different types so we can clear out some “maybe`s”. If you have any other facts and thoughts please let me know and I will be happy to put them down in this report.